In some cases, it is imperative to avoid the use of certain ingredients in a child’s birthday cake. Gluten-free, dairy-free, sugar-free and so on; allergies and medical conditions are dealt with in specialist articles. For the purpose of this article, though, let’s put aside restrictive diets and concentrate on the question: what, if any, are the do’s and don’ts of ingredients for homemade cakes? Why should we avoid certain ingredients?What should we use instead?The Main Offenders in thecake ingredients are that they can be high in saturated fats, calories, dietary cholesterol, sugar and refined carbohydrates. Young children are especially likely to pick up objects and pop them into their mouths. It’s natural touch, taste, sense, explore behaviour! However, if little ones do this (even for a split second) unsupervised, or in an unfamiliar environment, they are more likely to pick up something that has the potential to harm them; especially if we fail to recognise the potential hazards for them. Cake decorations are prime examples: little trees, small figures, fragile ornaments, ribbons and bows, sharp edges...The use of inedible ornaments might make the cake look spectacular, but for enquiring little ones, innocent investigation of them can be disastrous.When the cake’s ready to be cut, remove such decorations and place them out of reach. Nuts. Why use them in cakes for children? ‘What you see is what you get’ halved walnuts on top of a cake are one thing, but the use of chopped, flaked, pieces in the cake mix, or ‘mixed nut pebbledash’ to the outside for decoration is surely not necessary; is it? Extrinsic sugars are those added to foods (table sugar and syrup, for example) intrinsic sugars are part of the naturally sweet-tasting foods (carrots and beetroots, for example.) Extrinsic sugars causedamage to teeth; intrinsic sugars contain fibre, vitamins and minerals. Sorbitol and xylitol are referred to as bulk sweeteners and probably contain about half the calorific value of sugar. They are used in sugar-free sweets, diabetic jams and so on.Intense sweeteners have (virtually) no calories! Useful in calorie-controlled diets.So that you know which sugars your potential cake ingredients contain, check the nutrition information on packaging. 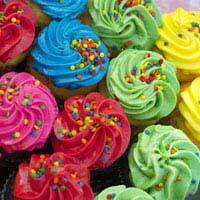 First, be reassured that food colourings are subject to strenuous testing before being passed as safe for human consumption, so using them doesn’t make you a bad person...Besides, their appeal is obvious; bright colours look attractive on cakes and sweets! We want ourhomemade cakes to look appealing; simple. Tartrazine (E102) is an additive used in some food colouring. It is permitted, but was listed as one to avoid by the Hyperactive Children’s Support Group. Tartrazine may also cause some asthmatics to have wheezy attacks. Sunset Yellow (E110) Quinoline Yellow (E104) Beetroot Red (E162) and Caramel (E150) are also among food colouring ingredients. Guar Gum (E412) and Gum Arabic (E414) are popularly used in sugar glue-the gunk that sticks pieces of sugar paste together. Try using plain water on a fine pastry brush instead...There are no hard and fast rules of what basic ingredients we should avoid. Safety, hygiene, common sense and personal taste are all relevant, too! One of the best feelings when you’ve made your child’s birthday cake is the look of wide-eyed wonder on their faces. The excitement and happiness they show at having their very own, specially made, cake can never be forgotten! As long as the kids eat a healthy balanced diet (most of the time) and their teeth are properly cleaned, the ingredients I’ve always used in birthday cakes are staying; in my family, at least!